No one knows better the challenges faced by electricians in the field than the men and women who do the job every day. It seems like an easy conclusion to draw, but too often, toolmakers and designers have never actually done the work their tools are meant for. It means there's room for enterprising tradesmen and tradeswomen to fill gaps that traditional toolmakers can't or won't fill. It was that entrepreneurial and problem-solving spirit that drove Philadelphia Local 98 member Stephen Bandura to step up and invent a solution to an on-the-job problem that was driving him crazy: turning ground clamp bolts. It's a task that nearly every lineman or wireman will do at least once, possibly thousands of times. 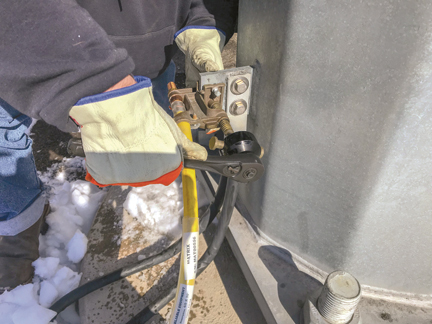 In substations or switch gear, tightening a ground clamp so gear cannot re-energize is a necessary part of working safely. But, it seems like every bolt is different. They're often irritatingly inaccessible, and whoever designed each bolt head seemed not to have accounted for workers wearing arc-flash spacesuits that are hot, clumsy and claustrophobic. For decades, this job was slow and required the use of jury-rigged tools — screwdrivers, the handles of side cutters, whatever was lying around. So, up went the universal cry of craft and trade workers living in a world engineers can't imagine: "There has to be a better way!" Bandura spent nearly two years working on substations for Merck & Co. pharmaceuticals wondering when someone would find a better way. Then he decided to do it himself. It's called the Puck, an attachment for a standard one-half-inch socket wrench. Bandura refined the design as he came across even more clamp bolts until he had something that worked on nearly everything. "When it didn't fit some bolts, we redid it," Bandura said. "Now we have it right. I have yet to find one that doesn't fit." And now he is ready to share the Puck, made in Arizona and available through specialty electrical tools manufacturer rack-a-tiers.com. For New Orleans Local 130 journeyman wireman Lixon Vilsaint, his there-has-to-be-a-better-way moment came while he was spacing parallel conduit runs. On some jobs, Vilsaint knew the distance between conduit runs would be precisely indicated in blueprints, but most places, it is left up to the worker. The only requirement is that it be consistent. "We use anything around us — scraps of wood, metal — anything that is close by and can fit the bill," Vilsaint said. But what if the scrap of wood gets tossed? Or one of the runs is handled by one crew and another crew finishes the end? There had to be a better way. Now there is. Vilsaint designed a set of three plastic spacers that don't require measuring once the installation begins. Two handle the most commonly used offsets and the third is a caliper that allows for custom spacing of up to five parallel conduit runs. All are brightly colored, lightweight plastic with lanyard attachments, so they won't kill anyone if they fall and won't get lost underneath the scrap that used to end up as makeshift spacers. Vilsaint is now trying to get where Bandura is — from a great idea to production. He is raising money through pre-orders to get a mold built. Twenty-five dollars will get the three-piece set at lixontech.com and 5 percent will go to his local, Vilsaint said. Vilsaint and Bandura spent dozens of hours bringing these tools to life to make our jobs easier. They both believe that there are hundreds more ideas rattling around in the heads of their brothers and sisters and hope their examples inspire others to make their ideas real. "Some union electricians, they are so thoughtful, have good ideas, but they're worried they can't find money. If we invent something that makes our lives easier, we should all be there for each other to make it real," Vilsaint said. "Only our brothers and sisters can support us." Ground clamp bolts come in all shapes and sizes; now one tool turns them all.